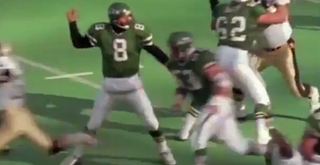 Before there was Mark Sanchez and his buttfumble there was Browning Nagle and his incredible-disappearing-football-oh-just-kidding-it's-a-Sam-Mills-76-yard-fumble-return. The play happened the day after Christmas 1992 and this spiritual older brother of the buttfumble is the most convincing evidence yet that the Jets are actually evolving as a franchise. How else can you explain the incredible strides made in organizational embarrassment?